For almost three decades, Kehilla’s Middle East Peace Committee has focused on educating our congregation about issues related to the Israeli/Palestinian conflict. 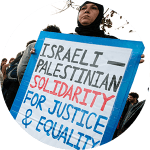 We plan to continue to engage in this vital work, and recently we launched a new project that will allow our congregation to have a supportive relationship with a progressive organization working for justice in Israel/Palestine. We are developing a partnership with the Center for Jewish Non-Violence, founded by Ilana Sumka in 2015. Ilana Sumka recently spent five years serving as Co-Executive Director of Encounters in Jerusalem where she built one of the most respected organizations addressing the Israeli/Palestinian conflict. She previously worked at American Jewish World Service and has served as a nonpartisan international election monitor in Bosnia and Albania. Ilana started the Center for Jewish Non-Violence in order to involve Diaspora Jews in actions to end the occupation. The Center honors the full equality and shared humanity of Israelis and Palestinians and supports Palestinian nonviolence. It does not take a stand with regard to either Boycott Divestment or Sanctions (BDS) or a single or two-state solution to the conflict. We first heard about the Center from Nikki Sachs, a Kehilla member who serves on the MEPC. Nikki travelled to Israel/Palestine in 2014 in order to work with the Center’s project of replanting trees in Palestine. As a partner with the Center, Kehilla will act as its West Coast base. Members of the MEPC will raise monies to help fund the Internship Program, which trains individuals in the use of non-violent action to end the occupation. We are planning to offer one or more scholarships a year for young adults who wish to journey to Israel/Palestine to engage in non-violent direct action. We hope to find young adults in Kehilla who will want to take advantage of this program. Plans are being formulated to host speakers from the CJNV to share their experiences and knowledge with our community. One such speaker may be Oriel Eisner, the Director of Activities for the CJNV. Rabbi David will soon be initiating a plan to take a group of Kehilla folk to Israel/Palestine and he will be working with the CJNV on this. Contact the Middle East Peace Committee at phw1999@yahoo.com if you would like to be more involved with any of these activities.